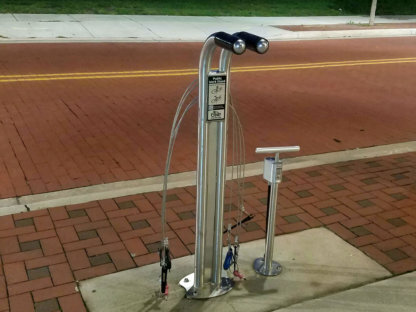 This bike pump was specifically designed for outdoor public use. It is the most durable, reliable, rugged, easy-to-use and affordable outdoor-rated public bike pump available. The bike pump is completely sealed from the elements. Solid stainless steel construction and impact-resistant gauge cover prevents misuse and vandalism. Our high-security public bike pump uses cut-resistant steel braided core air hose and dual valve pump head. A proprietary piston and rod seal ensures a long service life. The pump is backed by a two-year warranty. Even better, the pump is fully serviceable for a lifetime of use making it a truly sustainable product. 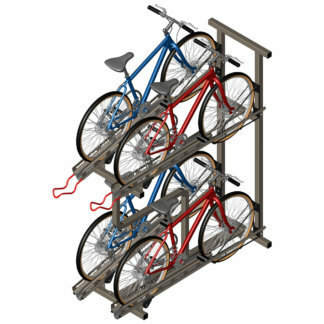 It is ideal for campuses, cities, trails, or other heavy use settings. This model also features an optional tool set tethered by stainless steel cable. The tool set consists of tire levers and an adjustable wrench, making changing a tube easy. 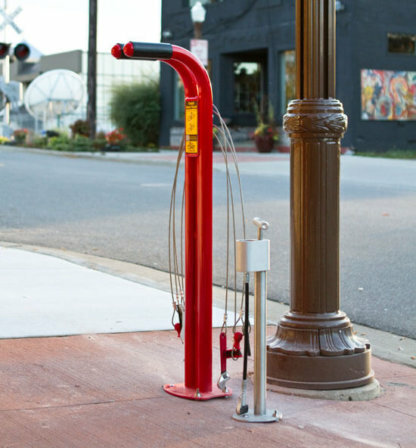 This self-service pump is a perfect match for the Public Bike Repair Stand to give bicyclists a complete work stand and air inflation facility at your business or institution.